You read that right. 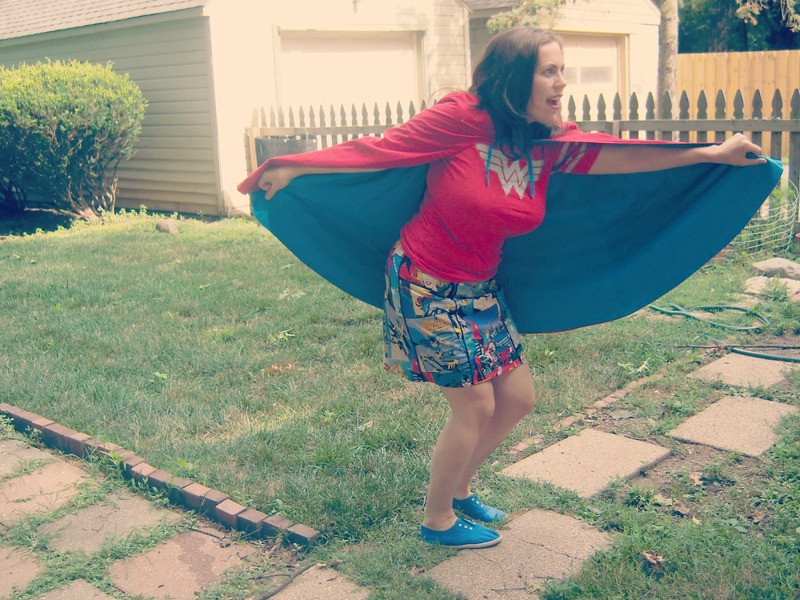 I made a hummingbird skirt out of comic book fabric. It is quilting cotton so it going to behave like quilting cotton. It’s not my favorite for garments but sometimes you just have to do it. Tempest Devyne alerted me to it. You can still get it at some JoAnn stores. It’s Cake’s Hummingbird skirt. I have my size already figured out so besides forgetting that I was piping, and having to rip out stitches so I could actually pipe this thing, it took no time at all. I made sure to serge all my raw edges before stitching so that, if need be, I can easily alter the skirt later. I flat lined all of the skirt pieces except for the ones that have the pockets. To flat line, I just cut the pieces I needed out of lining fabric and attached them to the piece they corresponded to and then treated that piece as if it were one. I do recommend lining or under or flat lining quilting cotton. It’ll feel nicer and crumple less. But, honestly, just make it. You gotta keep on sewing and you should sew what you love. So, here you go. Me, being a goof. And, Gillian, of course I have a cape lying around. I love you so much for this. SO. MUCH. I’ll definitely bring it to our Nashvasion. Yes! I will rock my dress and you will rock your skirt and it shall be epic! 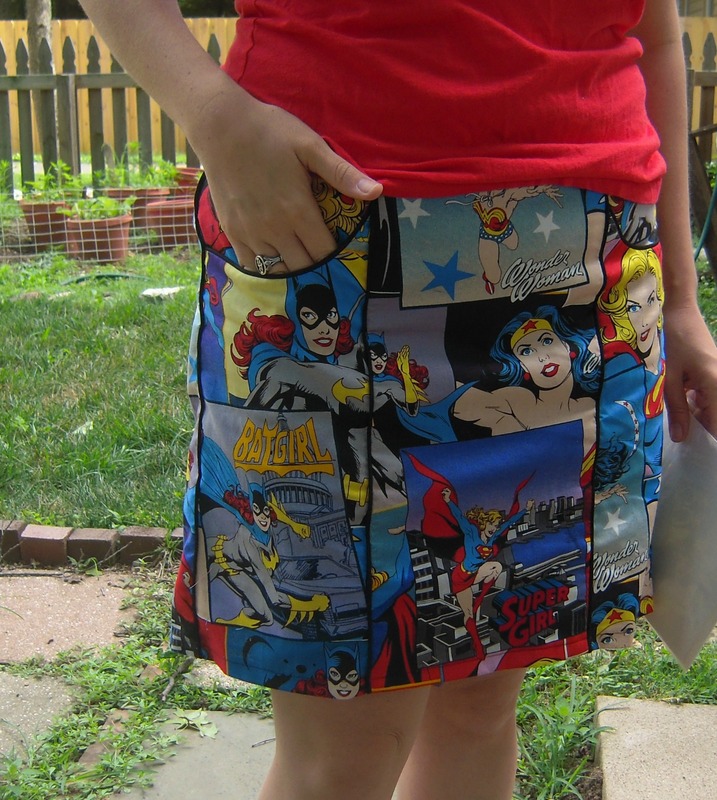 For real, that is the coolest skirt EVER!! thanks! I love that the pockets are perfect for my cell phone. Awesome skirt. Plus Super heroes ! Quilting cottons are fine for projects that don’t require drapey fabric. I make Hawaiian shirts and pajamas out of it all the time; who can resist the prints? oh, I know! The prints are just too awesome. Yay! You used it! I love it. I went into the Castleton Jo-Ann’s last week and they didn’t have this one anymore but they did have about a yard of a different all female one. I didn’t get it because I couldn’t do what I wanted with only a yard. I tooootally used it. 🙂 Another problem with this cotton is that it’ll fade and shrink even tho I pre-washed it. 😦 So, I’ll have to be super careful and treat it like a lady. Yay! I’m happy to hear that. Maybe it’s just the stuff I’ve gotten from Joann fabrics. Great idea. My nephews would love that skirt! I love your skirt! It is perfect for going with your shirt! thanks. I can’t wait to see your dress!! 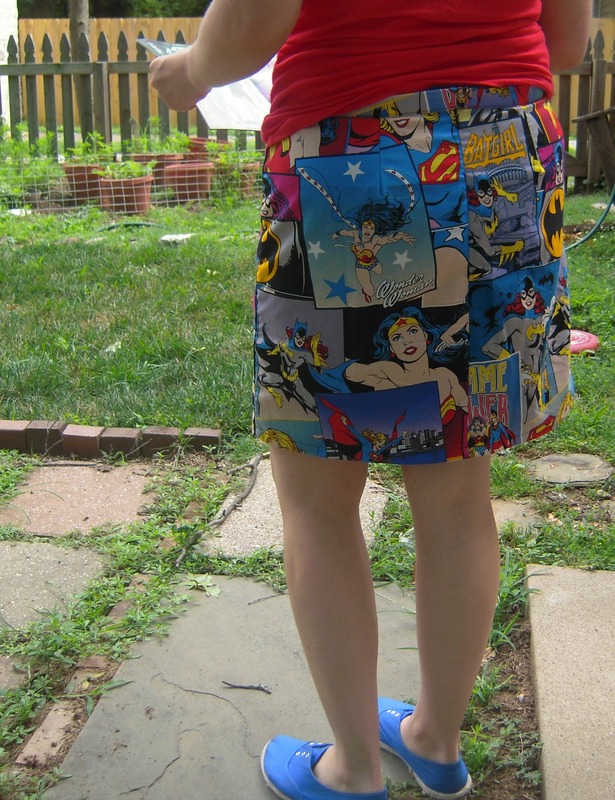 What a fun skirt, I love the piping … Your entire look is fab! You’re my super hero! Love this! yeah, no slinky dresses in quilting cotton. it’ll just make me weep and think I can’t sew…which, sadly, is probably what happens to some of us when we start out. Absolutely. The first thing I made was a sorbetto in quilting cotton, it wasn’t bad but it wasn’t good! I made a pavlova skirt out of quilting cotton. I agree that sometimes you just gotta do it. I also lined it, so it is quite comfy to wear and drapes nicely. Oh this is such a great make. Sometimes quilting cotton is absolutely perfect – especially in a cool print like this. Agree with the others, it work really well with this pattern. Heather said it! 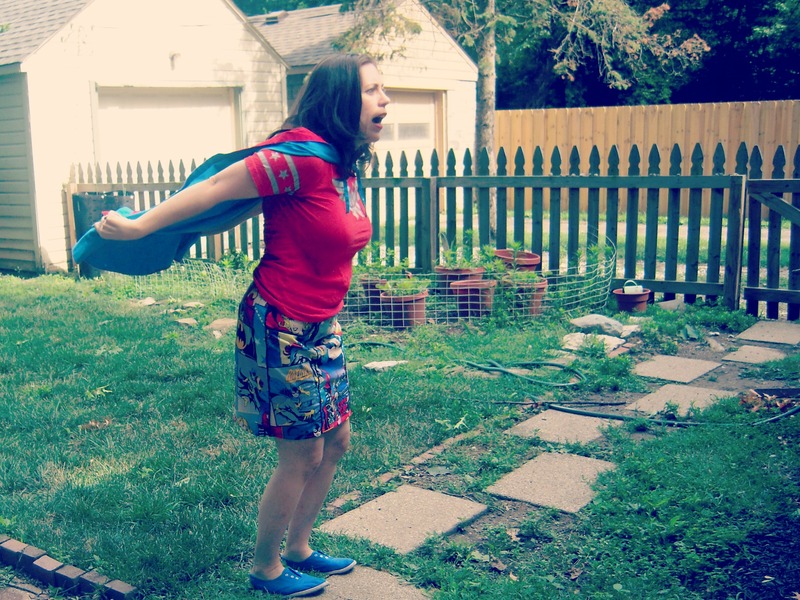 A cape just ready and waiting – so fantastic! Great skirt! your Simpsons quoting is perfect! I was hoping someone would. hehehe. You totally know I need the gauntlets. this is amazing. i also love that you have a cape around. but no mask? i love quilting cotton but i am always scared to use it in garments in case it doesn’t work. I thought of the mask but Wonder Woman doesn’t wear one..nor does my personal fave SuperGirl so I opted not to wear one. Love comic book clothes. 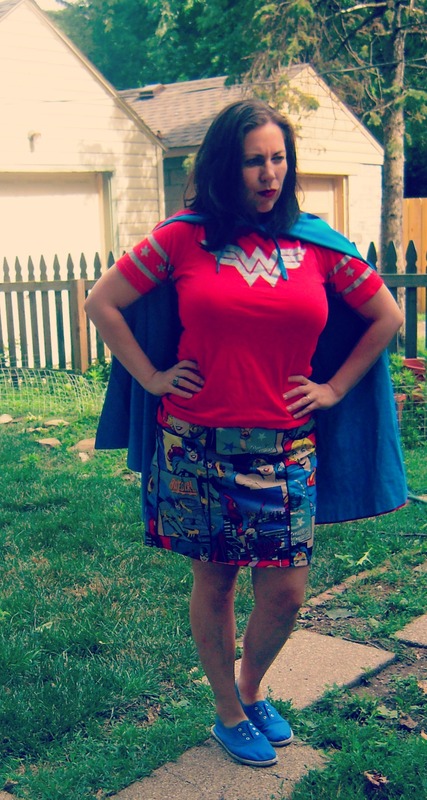 I’ve never owned any, never made any, and hugely admire anyone who sews up and wears cool superhero prints! I know what you mean about quilting cottons, they don’t always play nicely. However, as you have show here they come in such awesome prints! 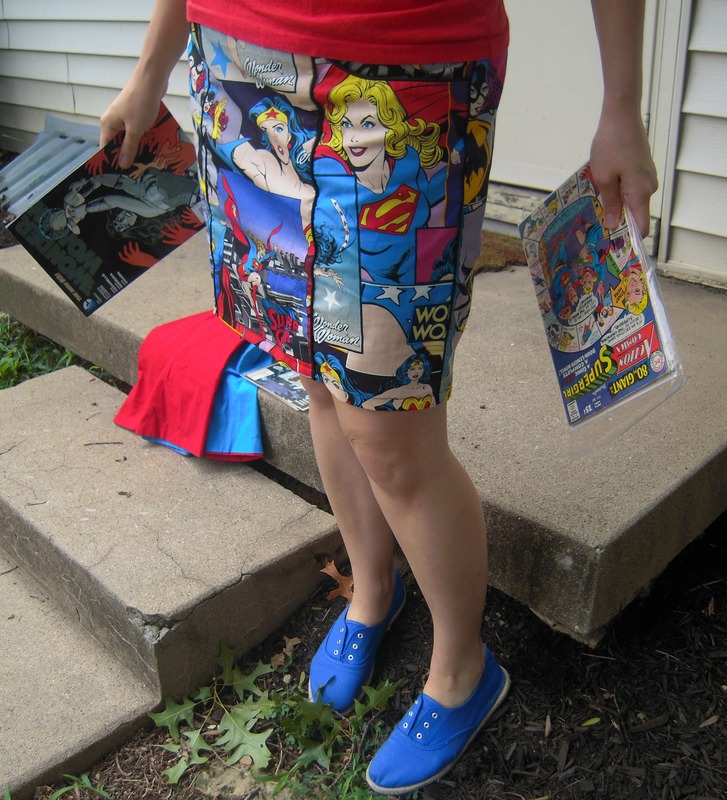 I LOVE your comic book skirt. Especially like the way the piping acts like the comic border, great job! Thank you! I read a couple of comics and the black was just going to be perfect. It’s fun when something works out like you imagined it. Thanks Susan! I’m totally loving the black piping as the frames. I’m wondering if I should’ve piped the zipper seam…that kinda bugs me that it’s not piped all the way around but also hard cos of the invisible zipper. If I was younger I would totally wear that print. It would make a great pair of shorts.I have this fear of “mutton dressed as lamb”. I already dress eccentrically as it is. LOL. I have to be careful of retro too. If you are almost 60 and wear anything from before the 50’s you just look like you never updated your style. Though I do make an exception for Boho. However, I do like camp shirts for me and Hawaiian shirts for Husband out of quilting cottons. I used to make my daughter’s horse show shirts out of the more old fashioned prints (she rode Western and color-coordinated show outfits with yoked western shirts were the style). I really like them for the granddaughters’ dresses and skirts. Lots of coordinating prints. Right now only one fabric store has a good selection and they want twice as much as any other store. It’s probably imported from the USA and better quality. I completely understand the retro thing. With my larger chest, I find that if I wear something super conservative- high neck and tame colors- I look about 10 years older. Interesting how that works. It’s the female equivalent of Sheldon’s t-shirts! Too cool! Super FUN!! Yes, I do sew some dresses in quilting cotton. I’m slowly expanding my fabric experiences and want to sew with voile soon..
thanks. I think voile is a great fabric after quilting cotton, tho linen is also a nice choice and you can find it in lighter weights for blouses and stuff, so long as you don’t mind the linen look. Lawn is also a lightweight fabric that is lovely to work with and nice after working with quilting. I LOVE THIS!! I think comic book fabric is fun and should be used. I have no problems sewing with quilting cotton, as I find it simple, but I know that it does take certain patterns in order not to look too ‘folksy’. I have never “flat” lined it before (I think I know that as underlining), but this is a great idea, would make the fabric look much more luxurious and substantial. Agreed. It can look really folksy. But hey, if someone likes it they gotta do it. Ok, no I’m curious what the difference between flat lining and underlining is.. It depends also on what u r making with quilting cotton. I recently saw a 1940s dress sewn with quilting cotton and it rocked!! I think what you call ‘flat lining’ I learned as ‘underlining’. Think it’s same thing? Underlining is when you sew lining to each pattern piece b4 u sew together then treat as one piece. Think that’s what u did. Yeah, that’s what I did. I think I got flat lining from corsetmaking but I’m self-taught so who knows what I picked up. “Flat-lining” is a costuming term (lining while the pieces are still flat and unassembled) while “underlining” is more of a couture/tailoring term used especially when there is an actual lining as well. I often flat-line skirts and don’t put in a true lining because it isn’t always necessary. Funny side note: my husband comes from a medical family and laughs at the idea of “flat-lining” because it means death to him, hehe. hehe, your husband is right! It’s not really different. Just different terminology for different areas of sewing. My costuming books usually put the other term in parenthesis next to whatever term they use. I’m not really into sewing clothes with quilting cotton- except maybe skirts for my daughters. I’ve seen it used in many cute ways, though. I say, if you like the fabric then go for it! Your skirt is awesome! Exactly! Cos ultimately you have to just keep sewing, no matter what. I’m not the biggest fan of quilting cotton garments, either, but this is totally the way to do it, and underlining is an awesome idea for beefing it up. I love your Spiderman dress! Yeah, in Leila’s world, there’s someone who designs comic book fabric in voiles, lawns and light sateens and poplins. this skirt is SO EFFING COOL! pure rulio! and i love that you have a WW t-shirt to pair it, with. brilliant! thanks!! I’m loving this skirt but honestly I wish it weren’t quilting cotton. It just wrinkles so easily. 😦 but still, superheroes! I have nothing but love for this–you did an amazing job of matching the print across the piping! And I’ve sewn with quilting cotton before. Sometimes the print just demands it–just need to choose the pattern wisely, that’s all. I’ll be sure to wear my cape walking down the street. Aw yeahhh!